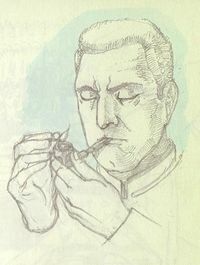 Keyes lighting his grandfather's pipe. Keyes' pipe was an heirloom tobacco pipe that belonged to Captain Jacob Keyes. Likely a corncob pipe in style, it was passed down to him by his grandfather. Despite being against regulations, Keyes kept it with him most times in his pocket, using it to aid concentration - not necessarily by smoking it, but at least holding it and chewing on its tip. However, there were two occasions in which Keyes ignored UNSC regulations and smoked his pipe on the UNSC Pillar of Autumn's bridge. By the 26th Century, pipes like his had become antiquated, replaced by self-lighting cigars and cigarettes. Keyes kept the pipe throughout his entire military career all the way up to the Battle of Installation 04, until he was infected by the Flood. The pipe can be found hanging from one of the tentacles connected to the Flood Proto-Gravemind, which was the Flood form Keyes was integrated into. The Marathon logo, also the ship emblem of the UNSC Pillar of Autumn, is marked on the pipe. Finding and looking at the pipe in Halo: The Master Chief Collection will unlock the No Smoking achievement. Keyes' pipe being held on to by the Flood Proto-Gravemind's tentacle. Halsey's illustration of Keyes' pipe.